Welcome, I'm so glad you stopped by! 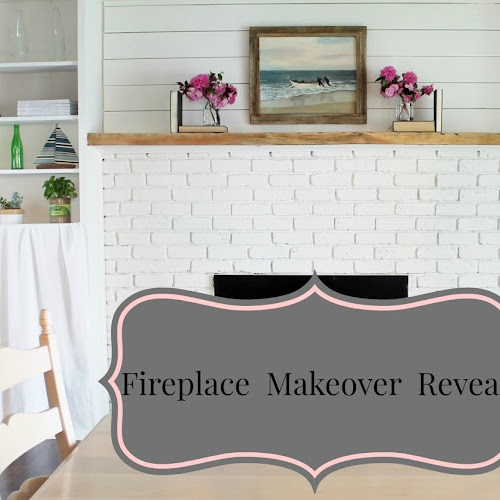 In my previous post, I shared my fireplace makeover reveal, you can read about that here. Today I'm sharing three different ways on how to style your junk on a bookshelf for a light, airy and uncluttered look. Use a collection of clear glass bottles on the top shelf, this instantly brightens the shelf. The clear glass allows the eye to see through giving the shelf visual interest without the clutter. Tip...no need to spend money here three of the glass bottles I used are soda bottles. Give a shelf balance by stacking books or magazines at both ends. Use colored glass bottles, (more soda bottles) fresh flowers, and plants for pops of color. The books, a driftwood sailboat, and a nautical rope add texture and warmth to the white shelves. Bring life to shelves with plants. Here I replaced everything on the first shelf with live plants. Line them up leaving gaps between each plant for a light and airy look. Make shelves tidy by using baskets and curtains. They are great for hiding all sorts of things. The white curtain is hung with a tension rod. Tin cans and buckets add farmhouse style and are perfect for holding flowers and herbs. Add wood like the candlesticks and a picture frame to warm up the white paint. Thank you for the visit, I hope you come back again! Love the look of the white shelves really makes all your decor pop! Thank you! I'm loving the white paint! it is great for showing off decor. What a difference white paint makes in the look of these shelves! You decor looks so pretty with white as a background. Thank you Laurie, the white paint certainly brightens them up. Love the new look and all your farmhouse goodies!! Thank you Betsy! I had fun decorating the shelves. Hi Julie - amazing what a little white paint can do! Love the new feel of your fireplace shelves! Thanks Tricia! I am loving my white painted shelves so much! Thank you Amy you are so right.. painting is a lot of work, but the results are worth all the mess and time it takes to paint. The shelves look great! I love the white paint and you styled them so pretty! Thanks Susan! It was fun styling the shelves. Hi, I'm visiting from Brenda's Cozy Little House. Love that your painted the shelves white; we've lived in this house 7 years and finally! painted ours white this past year - best thing we've done to the house! You shelf decor looks very pretty, I love the wire and and wicker baskets. Hi Mary thank you for the visit!! Painting the shelves white was the best thing I did to brighten the room up. I am glad I did! Lightening up those shelves made all the difference in the world! Nice options for decorating! Wishing you a wonderful week! I love this transformation and how you have styled these shelves! I love the idea of live plants on the shelves (maybe then my cats won't try to devour them!). Thanks for the inspiration! Thank you Meg for the visit! My cat was always into my plants, now with the plants on the shelf he doesn't even know they are around.